We can solve any lock-related issue, from electronic key programming and installations to lock replacements. Union Square Supply’s licensed locksmiths offer top-tier quality and 24/7 emergency, same-day service. Our professionals have diverse experience, from Triple Master Systems installations on entire buildings to average lockouts. We also offer welding expertise and are an authorized Mul-T-Lock dealer. As the best dealer-alternative for any chipped key or car lock problem, Union Square Supply saves you 50% from the price of most dealers. From key cutting equipment to key-by-code, onboard programming, and top-notch cloning, we can program car remotes and duplicate high-tech car keys for any make and model, including GM, Ford, Chrysler, Honda, Acura, Subaru, Mazda, Hyundai, Toyota, KIA, and Lexus. We also service motorcycles with and without transponders for Harley Davidson, Ducati, Yamaha, Suzuki, Zadi, Vespa, Buell, and more. 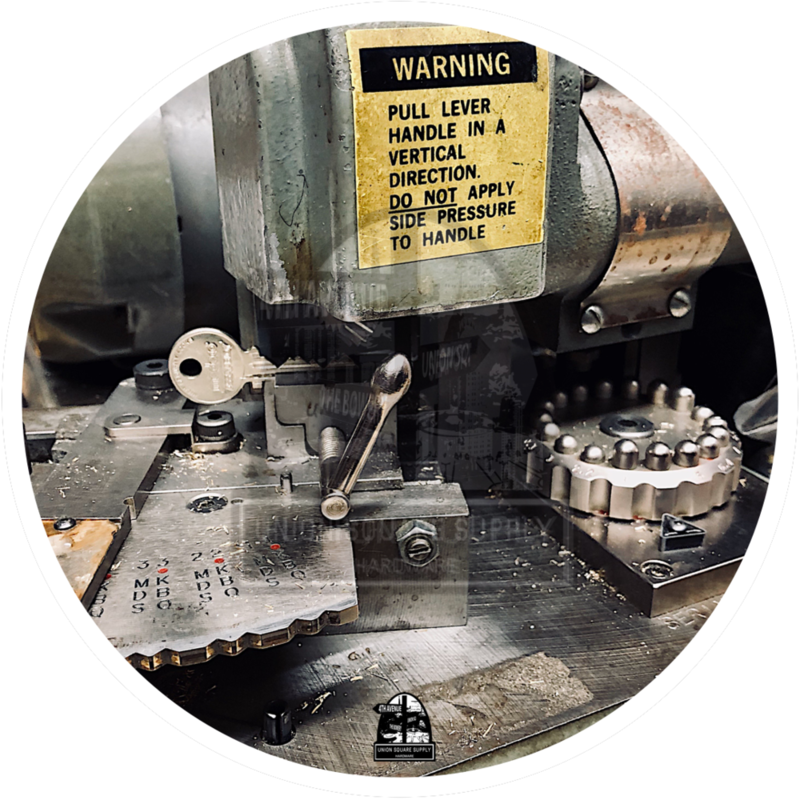 Providing key duplication for all types of keys, Union Square Supply’s premium machines can also work with one-of-a-kind blanks, including Medeco Biaxial and Schlage Primus. We make both laser cut and dimple keys, and feature an array of keychains including Nit Ize. After years in the industry, there isn’t a key we can’t copy. Rent hand and power tools at Union Square Supply. Stop by for grinders, saws, cordless power drills, bolt cutters, nail guns, up to 18’ ladders, carpet cleaning solutions, sanders, floor buffers, gasoline generators, and more. 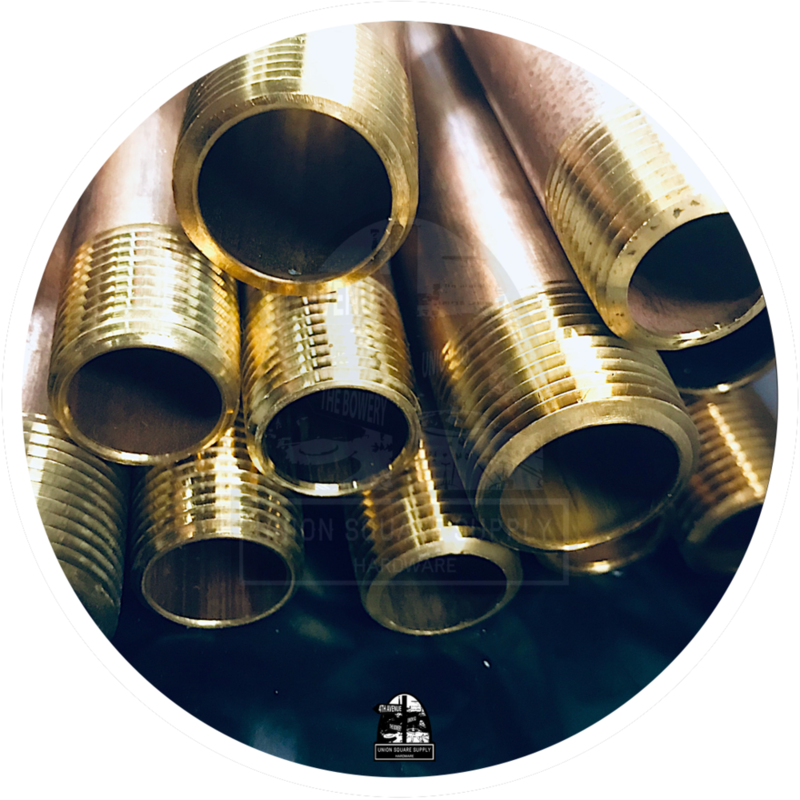 Equipped to cut and thread up to 2" pipes, Union Square Supply can work with any pipe material, from steel to copper. Union Square Supply can switch out batteries of nearly any kind. Whether you need a battery replaced for your watch or can't find a battery, visit us to get things done. Offering wood and shelf cutting, Union Square Supply can cut lumber to size from any variety, including 2×4’s and plywood. We also cut 1/8 to 1/4 regular glass and plexiglass for doors, windows, picture frames, tables, and more. At Union Square Supply, we can color match any paint brand. Our high-tech, paint scanning device reads your color for precision. When someone says a paint color can’t be matched, bring it to Union Square Supply to see magic. Proudly servicing special orders, we can perform custom metal work, cut metal to size, and take on full sheets of steel and aluminum. Next time you can’t find something, call Union Square Supply for a custom solution. Carrying the largest inventory of light bulbs in the East Village, Union Square Supply has over 3,000 bulb types. From halogen, hard-to-find incandescent bulbs, CFL, and LED’s in white, color, and backlight to blinds and shades, we have your lighting issues covered. Union Square Supply is the ultimate destination for all hardware and lumber needs, including masonite, plywood, sheetrock, and various 2×3’s, 2×4’s, and fine pine 1×2’s—1×12’s, plus sand mix, corner beads, supply metal studs, dash patches, Rocite cement, plaster, and more. As the premier option for all lock-related needs, Union Square Supply stocks Sargent, Omnia, Schlage, Marks, Medeco Arrow, Best, Valli Valli, Von Duprin, Yale, and Corbin Russwin locks. We can special order all kinds of cylinders or locks, and also carry and install code locks, proximity readers, access control systems, magnetic locks, electric strikes, and door closers. Union Square Supply can fulfill all of your electrical needs, with a wide variety of EMT pipes and fittings, outlets, outdoor and indoor boxes, switches, plates, dimmers, ballasts, romex cables, and more. We also carry an endless supply of time delays, buss fuses, glass fuses, and breakers, including federal pacific replacement breakers. 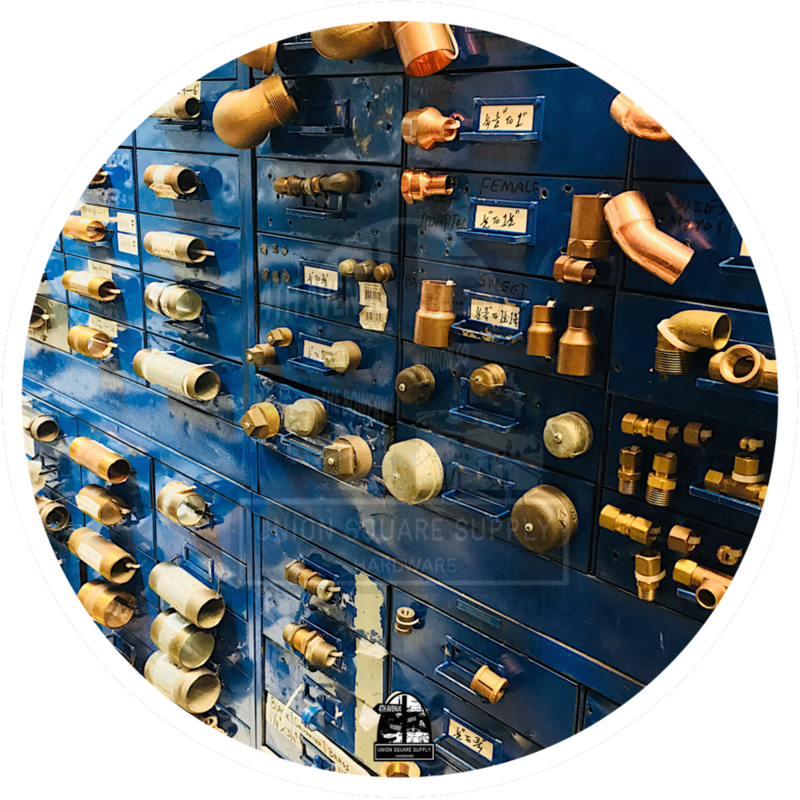 With a complete selection of galvanized, copper, brass, and black fittings from 1/8”—2”, Union Square Supply is the ultimate stop for plumbing supplies. We can cut and thread pipes from 1/2”-2”, and we carry all dishwasher hookup and sink parts. Union has compression fittings and hoses, plus toilet brands including Kholer, American Standard, Krowne, Toto, T&S, Gerber, tough-to-find brands, and repair kits and flushometers for Sloan, Delta, and more. We carry faucet parts, restaurant plumbing supplies, and everything else the industry needs as the go-to-resource. 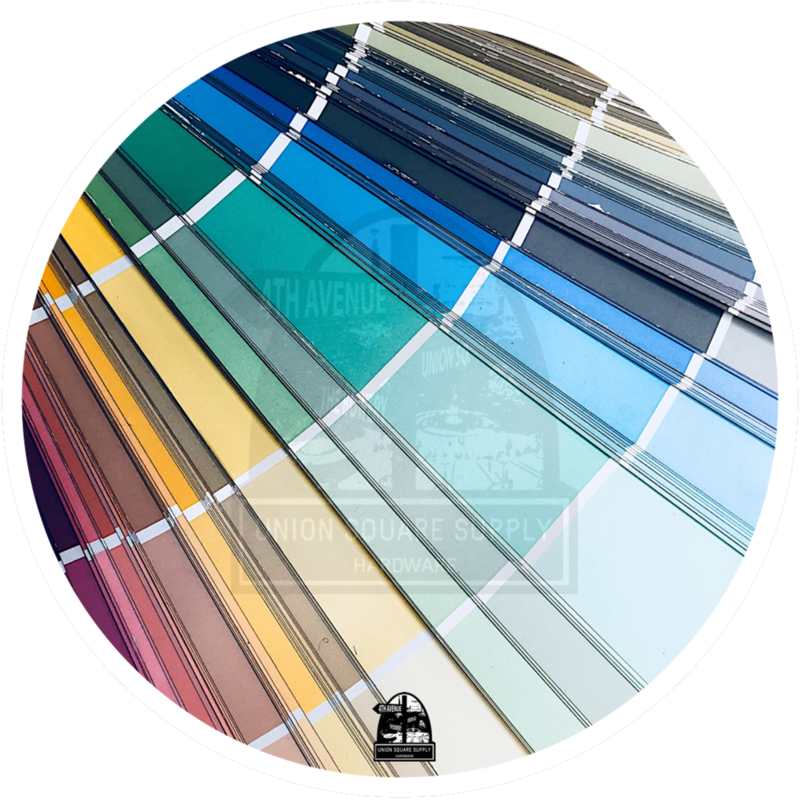 Carrying a broad line of California Paints (formerly Muralo Paint) and other leaders, we feature a full spectrum of styles and colors. Rather than spending money and time on marketing, California Paints ensures that resources are used in the lab on better products and color matching. We can also color match any paint brand. Our high-tech, paint scanning device reads your color for precision. When someone says a paint color can’t be matched, bring it to Union Square Supply to see magic. With one of the widest selections of screws in standard, metric, and larger and unusual sizes, Union Square Supply offers stainless steel, coarse thread, fine thread, and brass in any size imaginable. We also carry grade 5 and 8 bolts up to 1" for your next project. 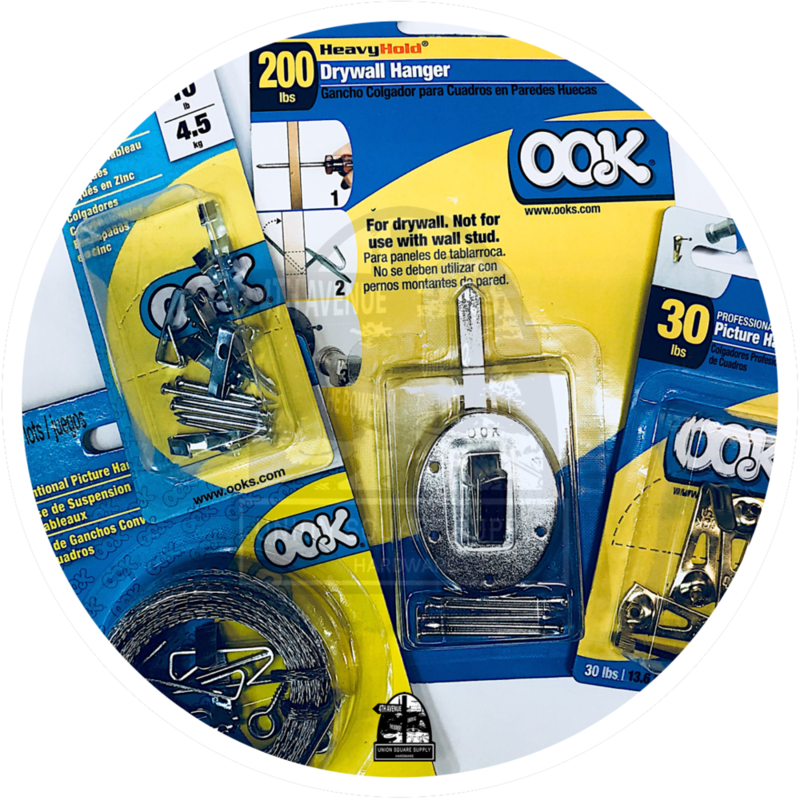 We have picture hooks, aides, pins, and hangers from 5-100lbs. in different variations, including OOK and those as seen on TV. Join the village in choosing Union Square Supply as the most experienced source for all renovation, construction, and DIY project needs. Est. 2018, Union Square Supply is the new name under new ownership of the first-ever, Ace Hardware, located in NYC's Union Square for nearly 100 years. We and our sister store, Fulton Supply & Hardware, are here to solve common and special problems, regardless of scope size. Our friendly team of experts speak English, Spanish, and Russian to help ensure your projects run seamlessly. We have everything you need and can special order nearly anything else. Our inventory is constantly updated with new equipment and merchandise to serve you better. Stop by to view our newest offerings. An emerging leader for Fortune 500 companies, commercial/luxury residential clients, and contractors. Beyond our selling floor near the 14th St.-Union Sq. station and The Bowery, we have four total floors of stock and delivery trucks for select corporate accounts. Tell us what you're seeking, and we'll show you to it or have it at the counter in seconds. Thank you for contacting Union Square Supply. © 2018 UNION SQUARE SUPPLY, INC.